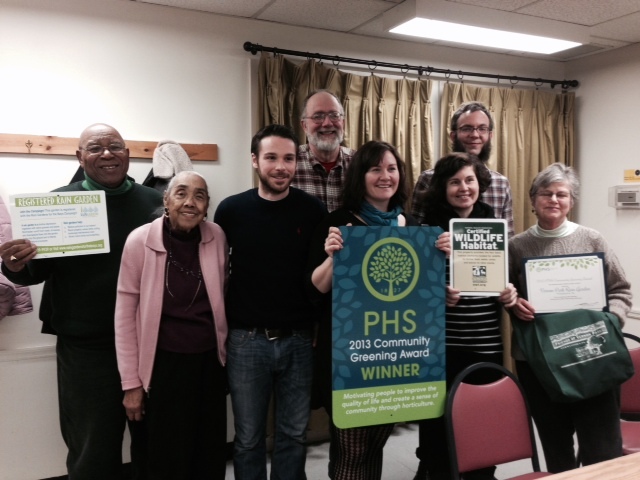 Friends of Vernon Park receiving our 2013 Community Greening Award from the Pennsylvania Horticultural Society, February 10th. Thanks to all of you who participated last year in the planting, weeding, pruning, and general maintenance of the rain garden. Join us this year too – when the snow finally melts. Thanks also to the Tookany/Tacony Frankford Watershed Partnership which got the whole rain garden project started and established. Please read this Newsworks Article by Alaina Mabaso. FOVP appreciates the presence and support of WHYY’s Newsworks!